Fifth Annual Summer Literacy Adventures Kicks Off! One of the most difficult tasks for educators during the summer is equipping students to stay engaged and interested in improving their literacy skills. As the summer is filled with vacations, beach visits and relaxation, it is important that our students also make time to maintain and further their literacy skills developed during the school year. In an effort to ensure that parents and students are aware of the summer slump and how it can negatively affect students in the coming school year, Florida’s First Lady Ann Scott, along with the Department of Education, the Department of Environmental Protection and the Florida Lottery are sponsoring the fifth annual Summer Literacy Adventure. The initiative encourages children to stay active and motivated about reading during this year’s summer break. Personally, I love reading. I read at least one book a week. It doesn’t matter what kind of book you read, as long as you are trying to read at least 20 minutes every day. Reading is the very best way that students can keep all the knowledge learned in school this year, and start next year ready to learn new things. Strong reading skills are an essential part of the learning process and we must do all we can to encourage our children to make reading a part of their daily lives. This year’s Summer Literacy Adventure kick off took place at the Governor’s Mansion in Tallahassee where nearly 70 local elementary school students were greeted by First Lady Scott. Students from Astoria Park Elementary School in Leon County and Galloway Charter Academy in Gadsden County were delighted by Mrs. Scott’s reading of Drew Daywalt’s “The Day the Crayons Quit.” The children also enjoyed an on-site scavenger hunt within the mansion and answered trivia questions about Florida’s wildlife. All the activities were designed to make students aware how important, diverse and fun reading can be. Whether it be non-fiction pieces like autobiographies and informational books, or fictitious tales like mystery or adventure, any reading works. Research shows that children who do not continue reading through the summer can lose a month or more of progress made during the school year. By encouraging their children to read, parents play an important role in ensuring every child reads at or above grade level. Each student can fill out his or her summer reading pledge on the Summer Literacy Adventure website. At the end of the summer, program representatives will announce which school has pledged to read the most books and the winning school will receive a special visit from Mrs. Scott. For more valuable resources for students and parents, visit the Just Read, Florida! office website. As families struggle to work toward educational success and economic security, it is becoming even more crucial for schools to expand their scope in meeting the vast needs of their school community. Alta Vista Elementary in Sarasota is a Title I school where 94 percent of students are on the free and reduced-price lunch program. Three years ago, we committed to becoming a community school by creating two generational programs that would meet the needs of both students and parents together. Our Eagle Academy, a seven-week academic/enrichment summer learning program, was originally developed for students entering kindergarten to better prepare them for school. During the past three years, our program has grown from 62 students who are now entering second grade to 250 kindergarten, first and second grade children. Achievement data has shown that the students who attend the Eagle Academy are better prepared academically for the next grade level and do not experience summer learning loss. During the Eagle Academy summer program, our parents attend adult classes one evening a week, while their children are in arts integrated/enrichment classes. This Parent University provides classes that promote successful student achievement through parent involvement. Classes also focus on strengthening life and parenting skills while fostering career and vocational training. Approximately 300 parents attend classes each week focused on Parents as Readers, Tips for School Success, Managing Behavior at Home, Health and Nutrition, Finance and Budgeting, Job Connection and Employability Skills, English as a Second Language, Technology, and GED classes. Many of these classes are also offered during the school year. Alta Vista is committed to supporting the educational success and financial security of our parents and children together. Our Two Generations…One Future programs provide intergenerational opportunities for students and their parents together. Our goal is to build education, economic supports, and social capital to create financial security that passes from one generation to the next. 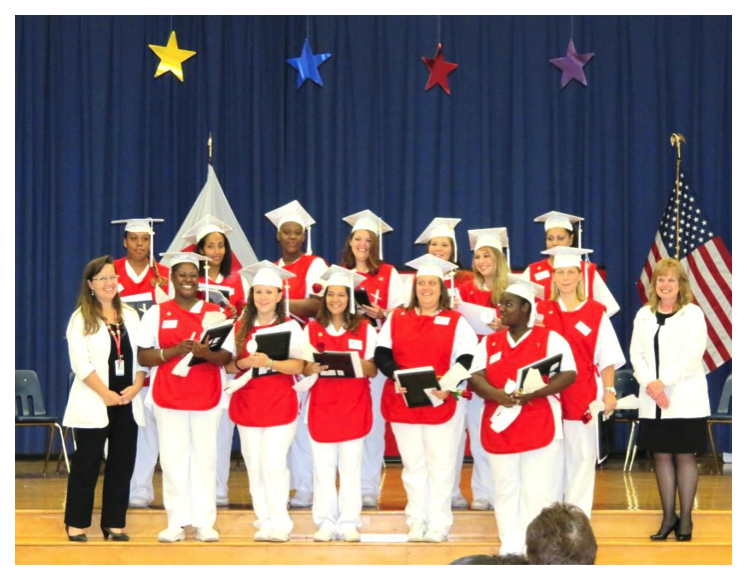 During the Eagle Academy and school year, single mothers are provided free educational programs in vocational occupations to increase their job opportunities and financial potential. Through the generosity of donors, these programs educate and train parents in specific careers or trades. These high quality training and education opportunities emphasize the skills and knowledge required for a job or trade. Our Two Generations…One Future programs are offered based on economic development indicators of job opportunities in Sarasota and parent interest. Some of the vocational programs include Certified Nursing Assistant, Cosmetology, Culinary Arts, Administrative Assistant, and Technology. Parents go through a stringent application and interview process before acceptance into the program. Alta Vista Elementary also partnered with the Community Foundation of Sarasota and American Red Cross to provide full scholarships to 37 parents interested in a certified nursing assistant (CNA) training program and two parents interested in cosmetology. All of these parents have passed state certification exams and are currently working in their field. The CNA program has been held at the school during the past two summer Eagle Academy programs and throughout the school year on our campus. At the end of each seven week program, a job fair and graduation ceremony is held at the school, celebrating our parents’ successful completion of the program and their opportunities for employment. During this ceremony, since most of our parents were high school drop-outs, they are walking across the stage for the first time in their lives. It is quite a celebration for our parent graduates and their families!! Through our Eagle Academy, Parent University, and Two Generations…One Future Programs, we are creating a community school dedicated to educating children and their parents together! (Top left to Bottom right: Catherine Beaudoin, W.C. Pryor Middle School, Okaloosa County School District; Ceola Graham, Madison County Central School, Madison County School District; Brian Furgione, Milwee Middle School, Seminole County Public Schools; Diane McKee, Williams Middle Magnet School, Hillsborough County Public Schools; Ashlynn Ramirez, Hernando Elementary School, Citrus County School District. The Florida Teacher of the Year award is one of the most distinguished honors an educator can receive. I am pleased to recognize the finalists for the 2016 Florida Department of Education/Macy’s Teacher of the Year for being the kinds of teachers whose impact far exceeds the classroom walls. Congratulations to each finalist on a job well-done. In the state of Florida there are 67 counties, 72 school districts and more than 180,000 teachers. Narrowing down all of the nominations was no easy task as there are so many qualified teachers. It took much time and deliberation during the nomination process, but our panel was able to select five finalists who we are very confident in. Ashlynn Ramirez, Hernando Elementary School, Citrus County School District. 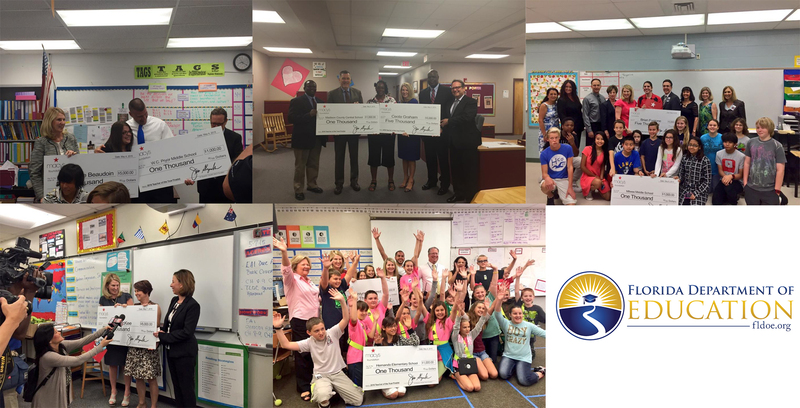 As a huge Thank You for all that each of our finalists do for our students in Florida, each District Teacher of the Year receives a cash award of $750 and $250 for their respective schools. The five finalists for Teacher of the Year each receive an award of $5,000 and a $1,000 grant for their schools provided by the Macy’s Foundation, along with a $500 Macy’s gift card. In addition, the Florida Department of Education provides over $70,000 annually to support the Teacher of the Year program. The Florida Teacher of the Year, selected from the five statewide finalists, will be announced at an awards gala in Orlando on July 9. The top teacher will receive a $10,000 cash award and an all-expense paid trip to New York City for the Macy’s Thanksgiving Day parade. The Florida Teacher of the Year also serves as the Christa McAuliffe Ambassador for Education, a goodwill ambassador representing the Florida Department of Education and teachers throughout the state for the Teacher of the Year program. To all of our finalists and educators throughout our great state, thank you for all that you do. You are tasked with a very important job every day and not enough can be said for the efforts you put forth. We are very thankful to have you all in our classrooms changing lives and creating leaders. Happy Teacher Appreciation Week. (l-r) Commissioner of Agriculture Adam Putnam, Attorney General Pam Bondi, Governor Rick Scott, Sherree Madorma (recipient), Chief Financial Officer Jeff Atwater. 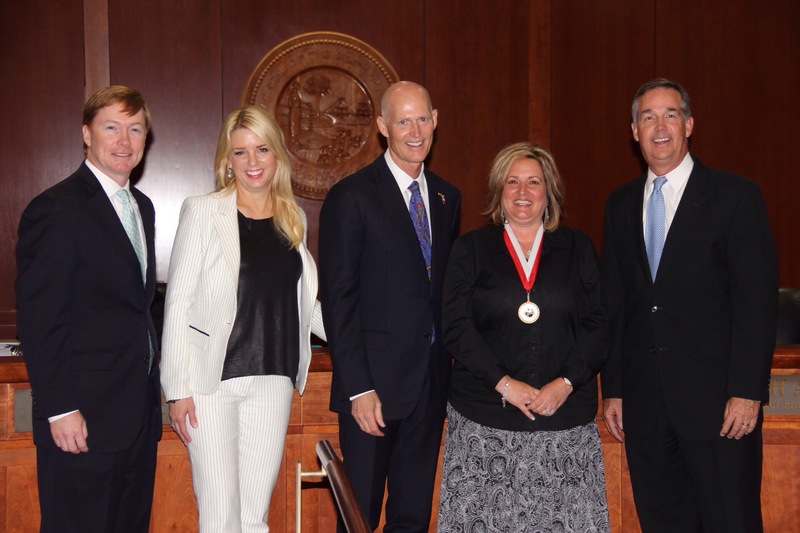 On Tuesday, May 5, 2015, during a meeting of the Florida Cabinet, Governor Rick Scott recognized eight outstanding educators from the around the state for their contributions to learning with the Governor’s Shine Awards. The Governor’s Shine Award is presented to educators and administrators in Florida who make significant contributions to the field of education. Governor Scott also proclaimed this week, May 4-8, 2015, as Florida Teacher Appreciation Week. Elizabeth “Beth” Box, Okeechobee County, Yearling Middle School – Beth Box has taught 7th grade social studies for six years. She works hard to prepare her students with real-life experiences to help them with their future college and career. Beth also serves as the advisor for Yearling’s National Junior Honor Society. She is a dedicated teacher and is always looking for new ways to help students and fellow educators succeed. Kelly Cotton, Osceola County, Celebration High School – A 12-year veteran of Osceola County Schools, Kelly Cotton teaches 11th and 12th grade students at Celebration High School. She strives to meet the needs of all students through the use of technology, primary source documents, and supplementary experiments. Bethany Crawford, Marion County, Forest High School – Bethany Crawford first joined Marion County Public Schools in 1997 and is a 16-year teaching veteran. She was recently selected as Marion County’s 2015 Teacher of the Year. Bethany also enjoys coaching the girls’ flag football team after school. Bethany considers teaching a privilege because it gives her the opportunity to see young people develop into engaged and active individuals. She feels that the best part of her day is helping her students see the best in themselves, while reaching their full potential. Jennifer “Jenn” DeWitt, Highlands County, Avon Park Middle School – Jenn Dewitt brings a positive energy into her classroom at Avon Park Middle School each day. She also serves as a science coach and the science fair coordinator. Jenn has a passion and desire to see her 8th grade science students succeed. Wallace Knight, Leon County, Apalachee Tapestry Magnet School of the Arts – Wallace Knight, a 5th grade mathematics and science educator at Apalachee Tapestry Magnet School of the Arts, has a passion for both teaching and learning. He is an instructional leader, Mini Mu sponsor, and STEM coordinator. Wallace challenges his students by providing memorable experiences in the classroom that stimulate learning and success. Each summer, he assists curriculum developers to modify and improve the science and math curricula for his school district. Thomas Speight, Jefferson County, Jefferson County Middle/High School – Thomas Speight has taught in the Jefferson County School System for 12 years. Speight is passionate about teaching history, and uses a variety of reading and writing strategies in his U.S. History and World History classes. Thomas uses various techniques to help students understand the significance of historical events, and encourages his students to debate their ideas in the classroom. Speight also tutors students before school, during lunch, and after school to help them succeed. Sherree Madorma, St. Lucie County, Rivers Edge Elementary School – Sherree Madorma began her 17-year teaching career in Coney Island, NY. Sherree currently teaches 5th grade students at Rivers Edge Elementary School, where 94 percent of her students have demonstrated learning gains in mathematics. She uses data and various learning techniques to enhance educational opportunities for her students and celebrates their progress each day. Sherree was recently recognized as the St. Lucie County District Teacher of the Year. Karen Wright, Citrus County, Floral City Elementary – Karen Wright has worked for more than 20 years in Citrus County helping students reach their full potential. As a combination 4th and 5th grade teacher at Floral City Elementary, she has high expectations for her students to succeed both inside and outside of the classroom. Karen utilizes technology to teach and assess students’ progress. She often collaborates with fellow educators in order to maximize self and student improvement. From left: Education Commissioner Pam Stewart, School-Related Employee of the Year Cheryl A. Thomas and Division of Public Schools Chancellor Hershel Lyons. In Florida, we are fortunate to have some of the very best teachers, principals and parents supporting and guiding our state’s students on their academic journey. Before joining the Department of Education, I spent more than three decades in Florida schools, and I had the opportunity to work with some truly amazing individuals, many of whom were not categorized as educators or administrators. From school crossing guards to cafeteria and janitorial personnel, there are thousands of school employees who play a key role in our children’s education without teaching a single classroom lesson. The work of all support personnel is absolutely critical to the success of our teachers and principals – and, most importantly, our students. With no bus drivers, how would our students arrive at school ready to learn? With no food service staff, how would our students receive the nourishment they need to focus in class? How could we ensure the safety of our classrooms without maintenance workers? Luckily, these are all questions we do not have to answer. To honor these unsung heroes, we coordinate the Florida School-Related Employee of the Year Program. The program recognizes outstanding education support personnel for the significant contributions they make to their schools and district school systems. 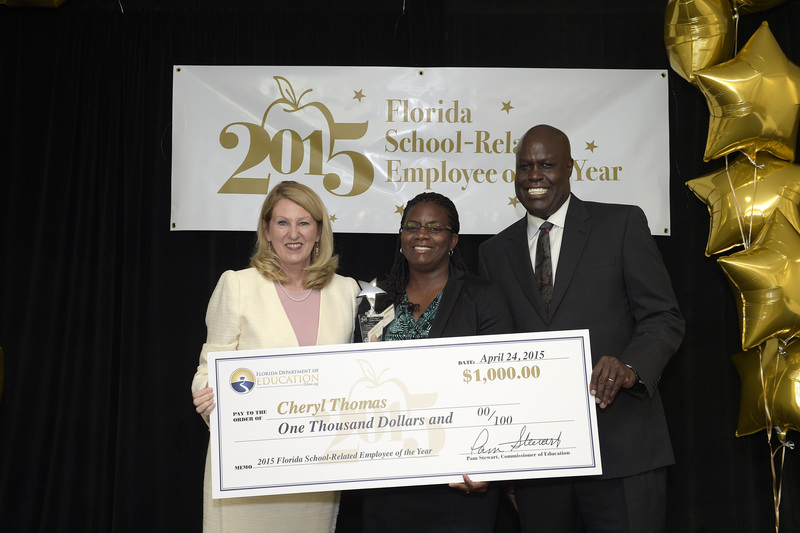 Last week, I had the privilege of naming Cheryl A. Thomas, a relief bus driver and training assistant in Pinellas County, the statewide 2015 School-Related Employee of the Year. Pinellas Superintendent Michael Grego noted that Cheryl is known for going above and beyond her assigned responsibilities to serve the Pinellas County students and schools. Congratulations, Cheryl, and thank you to all of our state’s school-related employees for all that you do for Florida’s students!